Well, it’s probably about time you start training your little one in the ways of the witch. Although you might want to save potions for when she’s a bit older. 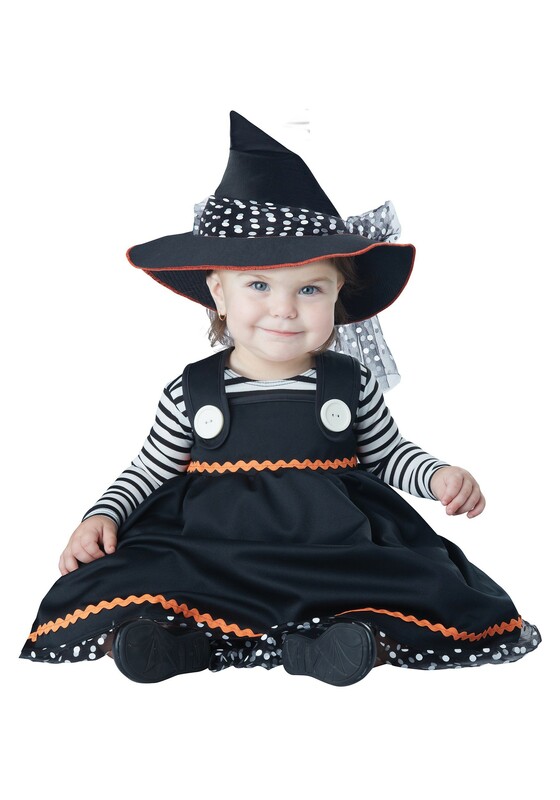 For now, you can grab her this Infant Crafty Little Witch Costume and she’ll be well on her way to being the cutest witch in the whole town! This adorable getup comes with a dress that already has a built-in netting petticoat. The striped undershirt is also attached to the rest of the dress. To complete her new supernatural look all you need to do is add the included cute cone hat and, viola. Before you know it, your home will be as wild as Fantasia! Although if you just hold off on teaching her the secret to magic, you’ll just have the most darling sorceress-in-training crawling around your home. Take her around the block this Halloween and she’ll be sure the charm all of your friends and neighbors. She’ll collect more candy than you’ll know what to do with, so you may want to start making plans! If your little girl is already a huge fan of accessorizing then be sure to take a look through our collection of fun witch-themed accessories. You can grab her a cute cauldron to carry around all her candy this year as well as a magic wand of a fast flying broom. Give the little girl in your world a magical Halloween by starting it off this Infant Crafty Little Witch Costume. Get her started young and soon enough she’ll be as masterful with her witchcraft as you!